"Oh daddy not again, you make me blush." "ahhh Dad! Mom is so not going to get over this taking picture thing! enough is enough! Somebody please rescue me!!!" -Baby. "Oh she's just so cute! oh look at her adorable watermelon outfit! "-everyone else. 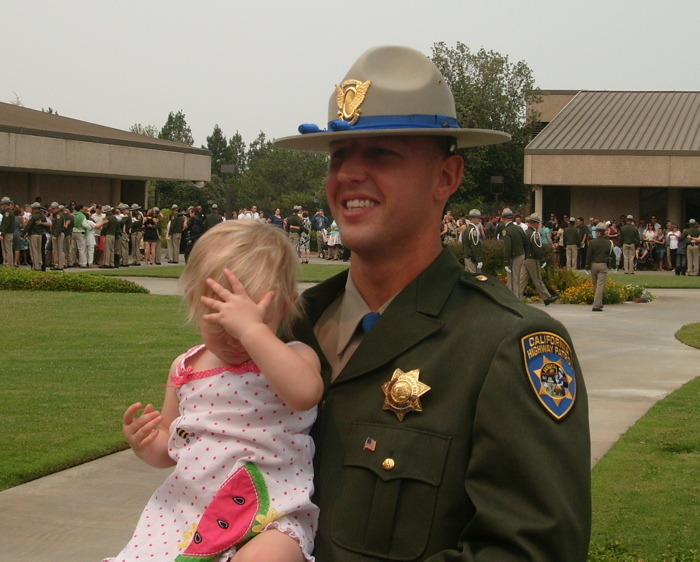 "Make sure to take a picture of that precious baby and her CHP Daddy!!! She is toooo precious!" -again., everyone else."uhhhhhhh......"-Baby. Yay! That really suits him. BUSTED!!! I told Cousin Noah NOT to drive our HotWheels so fast. "Ruined! I sure hope the laundry lady is able to get the watermelon out. "Congratulations, Superman, and may God bless you all in the days and years to come. Congratualtions!Gotta love a man in uniform! "Daaad! Mom's got the camera out AGAIN! "Btw, congrats to Josh!